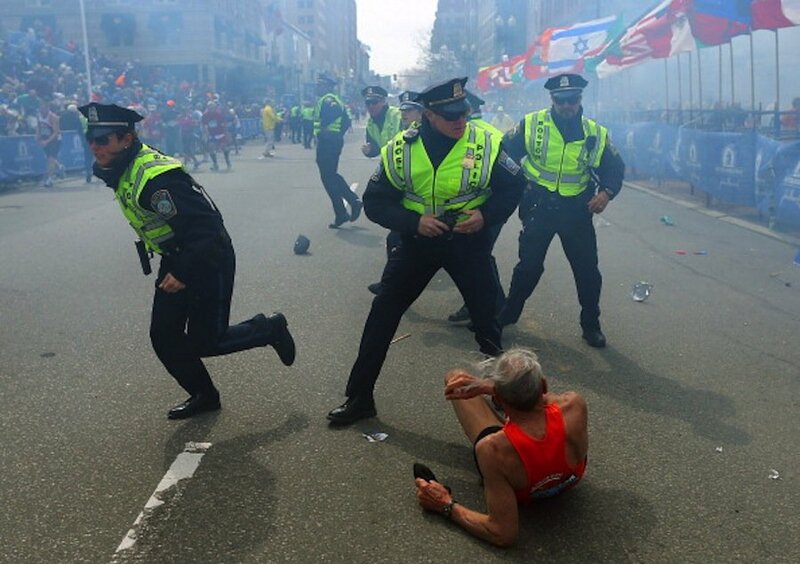 At 78 years old, Bill Iffrig was nearly finished with his third Boston marathon. Then, seemingly out of nowhere, a deafening explosion knocked him to the ground, directly in front of photographer John Tlumacki of the Boston Globe. Likewise confused and unaware of what was happening, Tlumacki reflexively began taking pictures—one of which became the now-iconic image of Iffrig surrounded by smoke and scrambling police officers. Miraculously, Iffrig was not seriously injured. In fact, he managed to get up and finish in 4 hours, 3 minutes, and 47 seconds. "After you’ve run 26 miles," explained the veteran of 45 marathons, "you’re not going to stop there." Iffrig walked a few blocks back to his hotel, unaware that his picture would go viral on the social networks. Sports Illustrated featured it on the cover of their issue on the bombings. As the managing editor explained, "we felt it truly captured the horrific moment at the end of the race." The word "capture" has a recurring role in reflections on images and their importance. It gestures toward a sense of ownership, of possession. The image is something to hold on to, so that we might contemplate the meaning of an event. At the same time, the right image is visual poetry. It resists categorization or definition through words alone, and forces us to embrace ambiguity. Here I call to mind Ed Linenthal's The Unfinished Bombing: Oklahoma City in American Memory. "There are certain images," he says, "that both capture the essence of an event and transcend the event, expressing through their eloquence what seem to be eternal human feelings, principles, truths." Linenthal goes on to examine the defining image of the Oklahoma City bombings, that of fireman Chris Fields gently cradling the limp body of one-year-old Baylee Almon. "It captured the horror of the murder of innocent children. It captured the tenderness of rescuers." What, then, does the Iffrig image capture? What do we learn both about this moment and about the "eternal human feelings" that it evokes? The details of the bombings are still fresh, requiring further elaboration and inspection. But for me, now, the image of Iffrig brings to light the stark contrast of life's joys and harsh realities. In the fallen competitor we are reminded that only moments before, he was engaged in the playful pursuit of finishing a marathon. I say "playful" not to suggest that this is easy. On the contrary, marathoners use metaphors of death and dying to describe their races. "I died out there"; "those last three miles were a death march." Dwelling in the land of hyperbole, runners use these words to communicate the cost of their efforts, and the ironic joy that they experience when testing the margins of their physical existence. As the running philosopher George Sheehan explained, "The music of the marathon is a powerful martial strain, a tune of glory. It asks us to forsake pleasures, to discipline the body, to find courage, to renew faith, and to become one's own person utterly and completely." The music of Boston is a unique tune. This isn't just 26.2 miles of pavement. To this point, Daniel Burke of the Religion News Service writes: "Just as Jews pray to celebrate Passover 'next year in Jerusalem' and Muslims pledge to visit Mecca, marathoners want to 'run Boston.'" Boston's mythical allure draws from many sources. It is the oldest marathon in America, started one year after the inaugural Olympics. The course itself is "sacred ground" to runners, with with notorious landmarks such as "Heartbreak Hill" and "Scream Tunnel." Then there is the race's exclusivity. Runners must meet specified time standards, based on age and gender. Only ten percent of marathoners qualify for Boston. Yes, Boston is the "Holy Grail" of distance running. 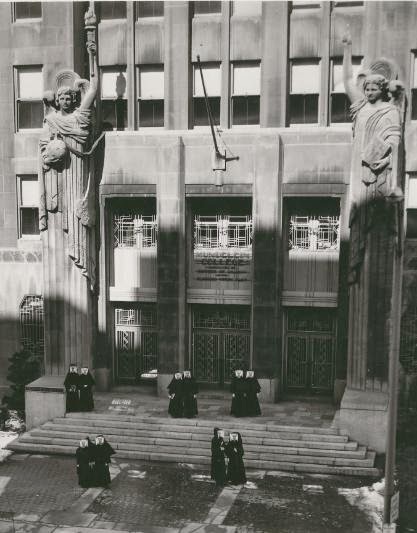 However, Iffrig’s uniformed counterparts in the image offer an alternative narrative. The explosions turned the morbid metaphors of marathoning into a reality. Thus, we witness the yellow-vested police officers running, only for a very different purpose. Directing themselves toward danger, their movements aim to quell the chaos, protect the innocent, and pursue the offenders. Captured in this image, then, are the lingering remains of a life-affirming celebration, blended with a portrait of ordinary people acting with extraordinary courage in the face of extreme danger. But if I could have one more picture circulating through the media, I would like to see Bill Iffrig crossing the finish line. While lacking the drama of the other, it would provide a useful afterword to this story of trauma, terror, sports, and the search for meaning. "All play has its rules," theorized Johan Huizinga in his classic Homo Ludens. "Indeed, as soon as the rules are transgressed the whole play-world collapses. The game is over." Bombs brought the play-world of the Boston Marathon to a definitive end. Lives were lost, people were injured, and tragedy displaced joy. Yet in the surreal few moments separating the bomb blasts from their collective comprehension, one person would not concede that the game was over. With the noise of the explosion still fresh in his ears, the music of his marathon was still playing. Indeed, the image of Iffrig at the finish line captures a sense of perseverance and resilience. It calls upon us to endure life's challenges in solidarity with others, and to always labor forward and finish what we started.